eat run sail: Nuzest News... New Recipes, A Sale, and a Fabulous Giveaway! Nuzest News... New Recipes, A Sale, and a Fabulous Giveaway! Yowzers! There are so many different ways to use protein powders these days... many clever foodies are baking up a storm, and powering up even decadent desserts with protein. They are making fudge, and cookie dough. They are baking cookies and cakes and flipping flapjacks. They are powering up hummus, and sauces of all kinds with added protein. A favorite protein powder of mine is this 100% golden pea protein from Nuzest. Clean Lean Protein. It is a complete protein that is vegan, with no soy, dairy, eggs or nuts... no additives or preservatives... no fillers no sugars or sweeteners. And I liked it so much I signed up to be an affiliate. In spite of that little commercial, I do think you will want to check out some of these creative and tasty ideas from Nuzest for yourself. Here is one that I know my vegan friends in particular will enjoy. It uses aquafaba from chickpeas instead of egg whites. Click on the image to follow the link to the recipe. I urge you to check the Nuzest site regularly for new ideas or sign up for the newsletter if you like. If you do decide to purchase, use my affiliate code eatrunsail to receive a 15% discount. And remember, shipping is free on orders over $50. That is a big deal these days... especially for Canadians where shipping costs are very high. And here is a bit of terrific news... the Creamy Cappuccino is on sale right now. That's right! 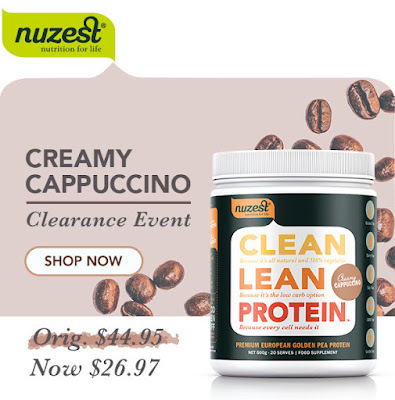 Creamy Cappuccino Clean Lean Protein with a best by date of September 2017 is now on clearance. Click on the image to shop. Unfortunately the discount code does not apply to clearance items. But I am looking at picking up 2 of them myself... Happy Birthday to me! 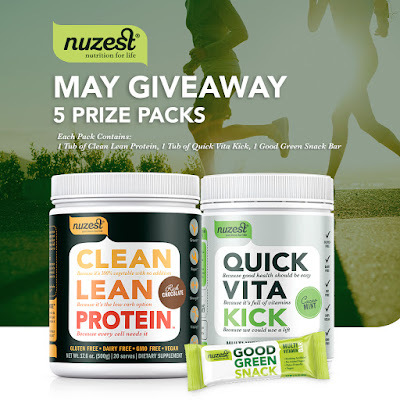 And last, but certainly not least, Nuzest has a terrific giveaway happening throughout the month of May. You have an opportunity to be one of 5 lucky people who will win a tub of Clean Lean Protein, and a tub of Quick Vita Kick, along with one Good Green Snack bar. Follow the link on the image to enter. Canadians and Americans may enter. It's always a challenge to find a protein powder that you like. I'll definitely enter the giveaway! I've never done the aquafaba thing. I'm totally on the fence... lol! You had me at marshmallow fluff! Wow! This sounds really good! I haven't tried aquafaba. I do like the pea protein. I'm not big on protein powders - I don't really use a lot of smoothies in my life (it's a texture thing). Aquafaba is pretty intriguing though. I made Aquafaba meringue cookies last year - it was amazing! 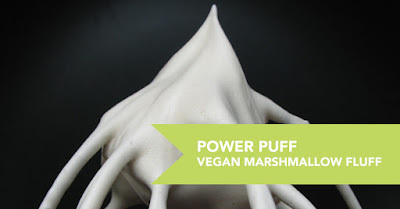 Vegan marshmallow fluff? Sign me up! I use pea protein powder occasionally, mainly in homemade energy bars. I have not tried this brand before- I will enter the giveaway- thanks for sharing! I used to drink protein shakes daily! Thanks for sharing these! I have not seen this brand before, looks good, I will def enter the giveaway. Unless I have a recipe to follow, I wpuod never think to use protein powder to make something other then a drink! I'm with Anna, I only routinely use protein powder to make shakes. Unless I have direction, I have no idea what else to do with it.